Glaucoma is one of the leading causes of blindness and visual impairment in the US, and can affect patients of all ages. Many glaucoma patients do not experience any symptoms and may not be aware that they have the disease. Glaucoma actually refers to a group of diseases that cause damage to the optic nerve as a result of increased pressure within the eye. Occasionally it can also be caused by injury, blocked blood vessels or inflammatory conditions of the eye. There are two main types of glaucoma, open-angle and angle-closure. Open-angle glaucoma is the most common type of glaucoma and involves fluid in the eye not draining properly through the trabecular meshwork. Angle-closure glaucoma involves a sudden buildup of pressure in the eye and poor drainage because the angle between the iris and the cornea is too narrow. This less common type of glaucoma can cause eye pain, redness and halos around lights. Many patients do not experience any symptoms during the early stages of open angle glaucoma. This makes it difficult for many patients to know if they have the disease. As glaucoma progresses, patients may experience a loss of peripheral or side vision. Our goal is to diagnose and treat glaucoma before vision is lost. While some patients may experience symptoms from glaucoma as the disease progresses, others do not learn they have the condition until they undergo a routine eye exam. There are several different exams performed to diagnose glaucoma, including a visual field test and optic nerve measurements. Other tests will also be performed, such as tonometry to measure the pressure inside the eye and pachymetry to measure the thickness of the cornea. possible to help minimize the risk of permanent vision loss. There is no cure for glaucoma, so treatment focuses on preventing further damage from occurring. 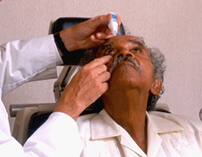 Most cases of glaucoma can be treated with eye drops, laser surgery or microsurgery. The best treatment for your individual case depends on the type and severity of the disease, and can be discussed with your doctor. Eye drops are used to reduce fluid production in the front of the eye or to help drain excess fluid. Eye drops are usually well tolerated, but can cause temporary stinging or blurred vision. Patients should tell their doctor about any allergies or illnesses they have to minimize the risk of side effects. Laser surgery for glaucoma aims to increase the outflow of fluid from the eye or eliminate fluid blockages through laser selective laser trabeculoplasty, iridotomy or cyclophotocoagulation.